NPoCP: Fatlace/Rocketbunny FRS for 35k. 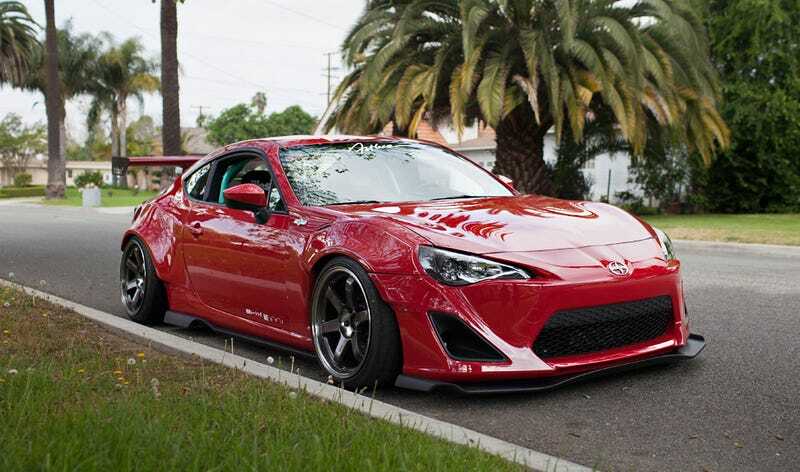 Fatlace is selling their 2013 Scion FRS. It has only been driven for 5500 miles and features the very popular Rocket Bunny kit. The bolt on fenders are filled with beautiful Volk TE37SL rims - a style of wheels that is as JDM as it gets. I really dig the new front lights, they suit the car well. Not so sure about the rear ones, they in comparison look like cheap Lexus style clear lights. Other goodies include a full Cusco suspension, a roll cage, a GT wing, Brembo Brakes and beautiful Illest x Bride seats. Fatlace claims to have invested more than 50 grand worth of parts into the Scion, and is now ready to part with it for a modest 35k. 5k more over standard for such a car? I say NP all day. What do you think? Take a look at the offer and full spec sheet here.